The use of data management platforms (DMPs) among industry professionals continues to grow. 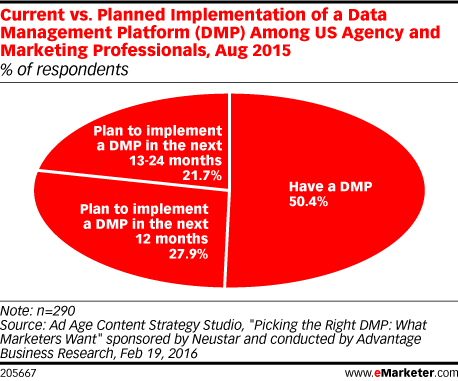 Yet, those same marketers are skeptical of DMPs' ability to deliver on expectations and business goals, according to research. More top 1,000 retailers have sent a shopping cart abandonment message in 2015 compared to prior years, according to research. Many consumers prefer traditional methods, like a phone, to communicate with a company. But according to November 2015 research, the phone can also be the most frustrating customer service channel. As deployment of LTE mobile networks continued in Argentina during 2015, shipments of smartphones that support the technology grew more than 1600% compared to the prior year. eMarketer expected a strong 2015 holiday season for ecommerce and total retail sales. In this webinar, we take a look at the final results and review what retailers need to know about changing consumer behaviors to keep up in 2016. Topics include: How the overall retail sector performed during the 2015 holiday season; Why experiential gifts were one significant holiday trend of 2015; How consumers used their phones and other mobile devices to shop last holiday season; How deal-seeking behaviors are changing the holiday shopping calendar. Christopher Curtin, chief brand and innovation marketing officer at Visa, discusses the challenge of integrating marketing tech companies. Shop.ca executives discuss how Canada's online marketplace uses email to reach customers. Tip Rose, vice president of enterprise digital marketing at healthcare supply chain Cardinal Health, spoke with eMarketer about how the company manages its marketing stack and braces for changes. Smartphones are increasingly the digital device of choice for many consumers in Germany, according to research from Bitkom. Internet users in South Korea are losing faith in traditional media, according to longitudinal research. Trust in digital channels, meanwhile, is holding steady. Mobile is increasingly becoming an important part of the shopping experience. 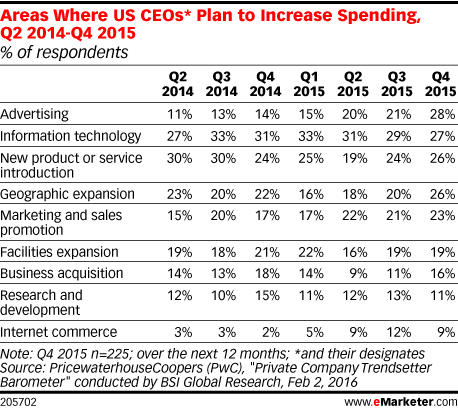 In fact, most digital buyers will make purchases via a smartphone by 2017. And according to research, certain verticals like health and beauty have seen an increase in mcommerce transactions compared to the year before. What do internet users in Asia-Pacific want in a smart home? Most agree that security is tops—but there’s room for much more education. Facebook will reach a key milestone this year, with more than half of the UK population using the social network on a regular basis, according to eMarketer’s latest social network usage forecast. Amory Wooden, director of brand marketing at Squarespace, discusses how the company created a memorable second-screen experience during Super Bowl 50. Tom Tate, product marketing manager at global email services provider AWeber, discusses the value of having a team monitor regional laws to ensure email compliance for clients. Claire Bara, vice president of marketing at Rona, discusses the issues the company faced after Canada's Anti-Spam Legislation (CASL) went into effect. Michael Tiffany, co-founder and CEO of digital advertising cyber security company WhiteOps, explains how the security industry sees ad blockers and the issues presented by malware and ad blockers.